My frugal tip for today is to try to buy local in season produce. I try to buy as much local fruit and vegetables as I can. I do not have a CSA near me, so that is not an option. I do however have several farms and orchard near where I live. There are several blueberry and blackberry farms that offer both u-pick and items they have picked. 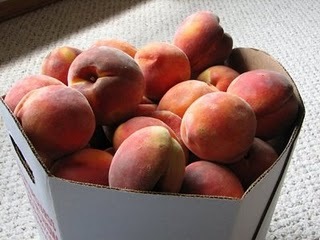 This week I bought peaches from a local orchard. They taste wonderful. They are so fresh. They are much better then I can get in the supermarket and cheaper. I did have to buy in bulk to get a better price, but we will easily use them up in the next week or so. I will also freeze a few of these to use in smoothies over the next few months. I go to this same orchard in the fall to buy apples. Again I buy in bulk but apples usually last a while, especially if kept cool. We have a garden this year but in the past when I did not do a garden I u-picked tomatoes and other things. So look around, call a few places and check some prices. You might be surprised at how much you can save buying local in season produce. I love to buy produce like this. Unfortunately I have to go on vacation to do it! AZ is so hot that we don’t have farmer’s markets, etc. It is one of my favorite things to do on vacation though! I love this idea. I need to get out there and see what I can find. There are several Farmer’s Markets around here, and roadside produce stands. I think the next time I drive by one I’ll stop and check it out!